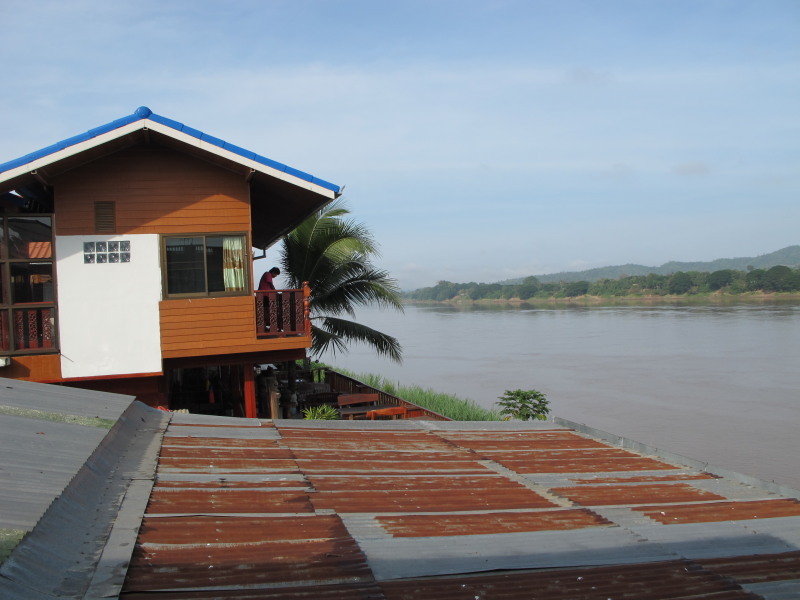 14th November, 2012, Chiang Khan. After a night disturbed by revellers, a crying baby and crowing roosters became the wake-up call. The ‘roof top’ view out my window. 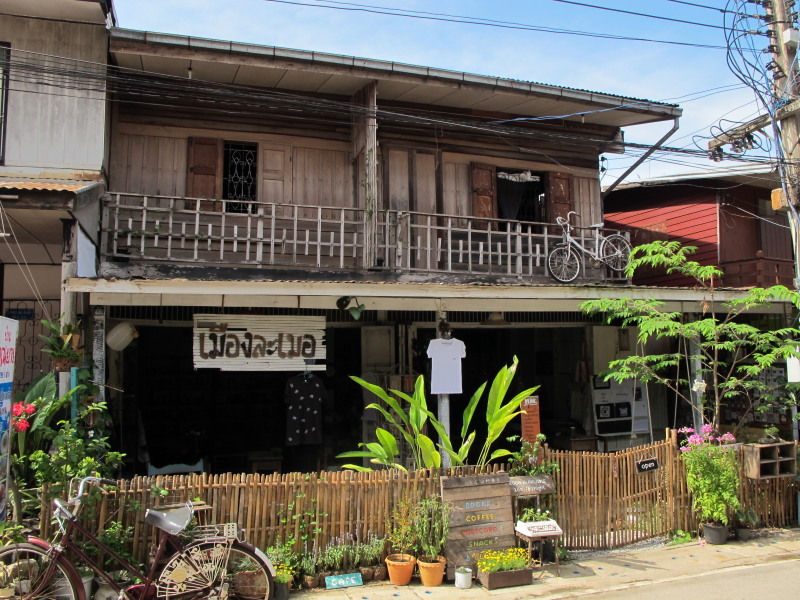 In the early morning, a few Thai tourists were out and about in the main street cycling and taking photos, but there were no cafes open yet. This was actually taken at sunset, but never mind. “Free,” a woman on a bicycle said, pointing to a bunch of bananas hanging at a street-side cubicle, so I helped myself to one. The stall was plastered with hand-written signs, including one in English that read “No Dams”. At a guess, it was probably a protest about developments upstream in neighbouring countries (but no one was attending to confirm either way). The wai greeting woman of last night had her small stall open for business, so I got my Americano fix there with complimentary orange tea. 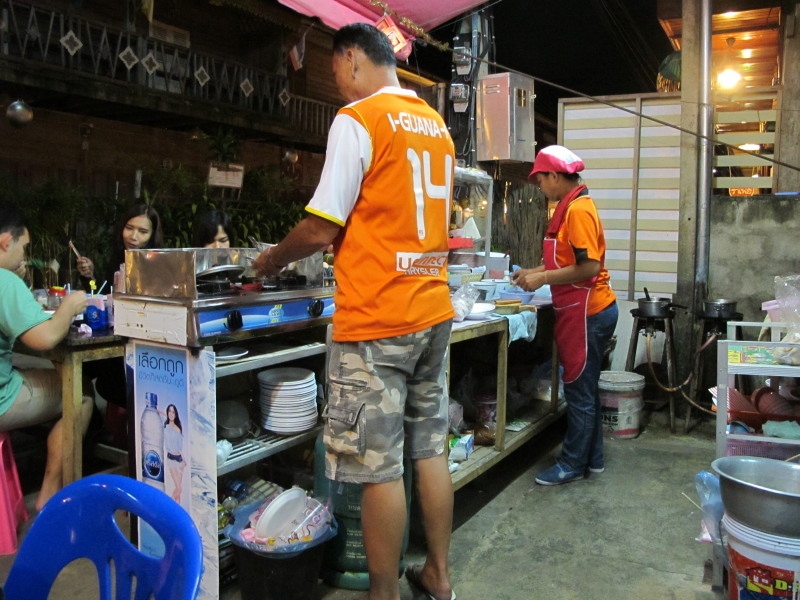 A 30 baht breakfast soup, at a place further around on the main road, was the follow up. 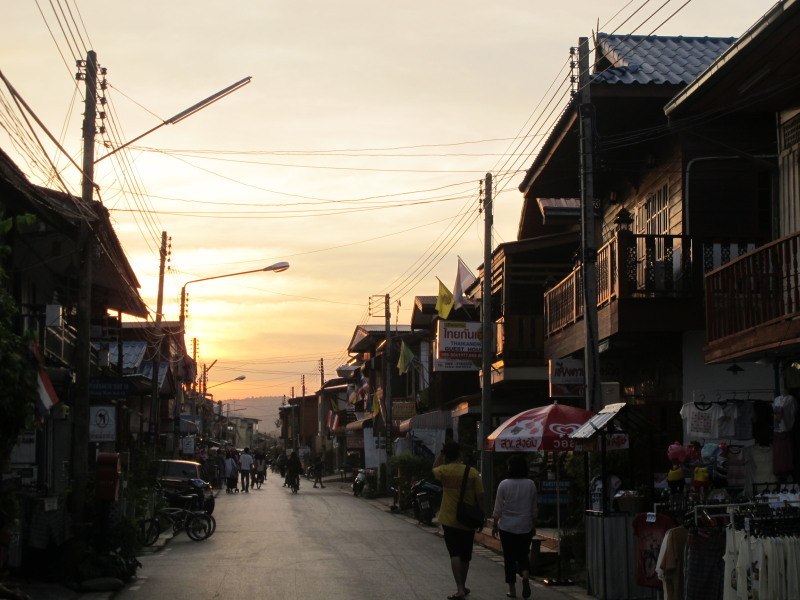 I was gaining a more positive impression of Chiang Khan (locals friendly, and not jaded like in some tourist areas), so I decided to stay tonight and spend the day exploring its surrounds. 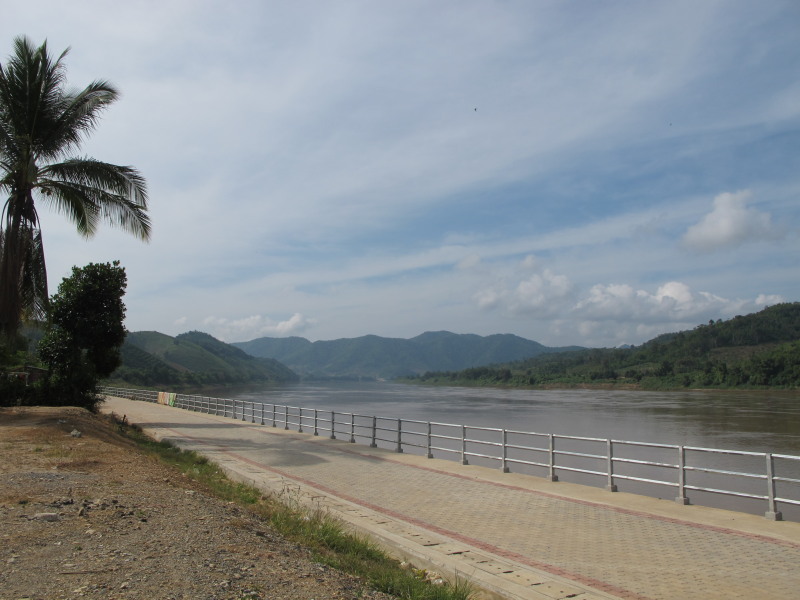 Gung had suggested seeing the Big Buddha, which is beside the Mekong, upstream. According to a map Pim gave me it was 12 ‘k north, but it was closer to 20 ‘k, on roads not as rough as Gung had hinted at. This is actually a side road. 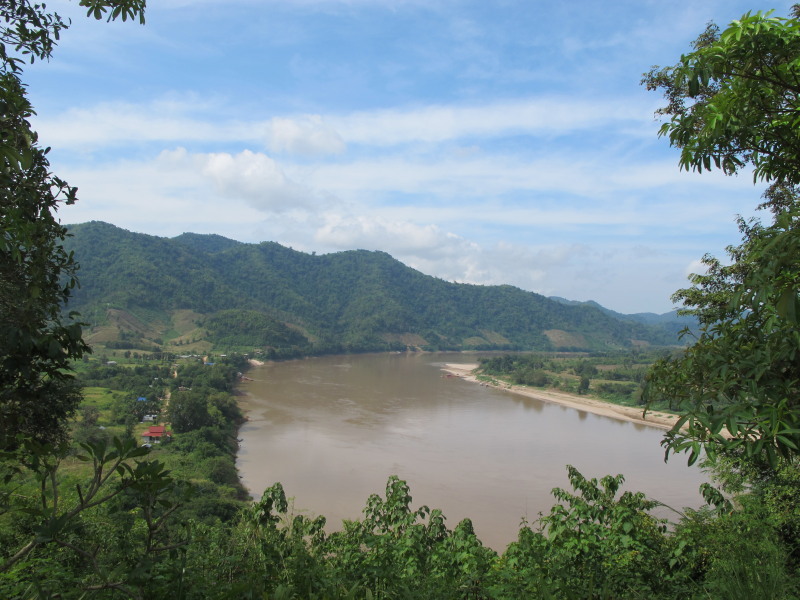 Along the way, I sought out a feature evident on the map, a bend in the river where the Mekong entered Thailand from Laos. 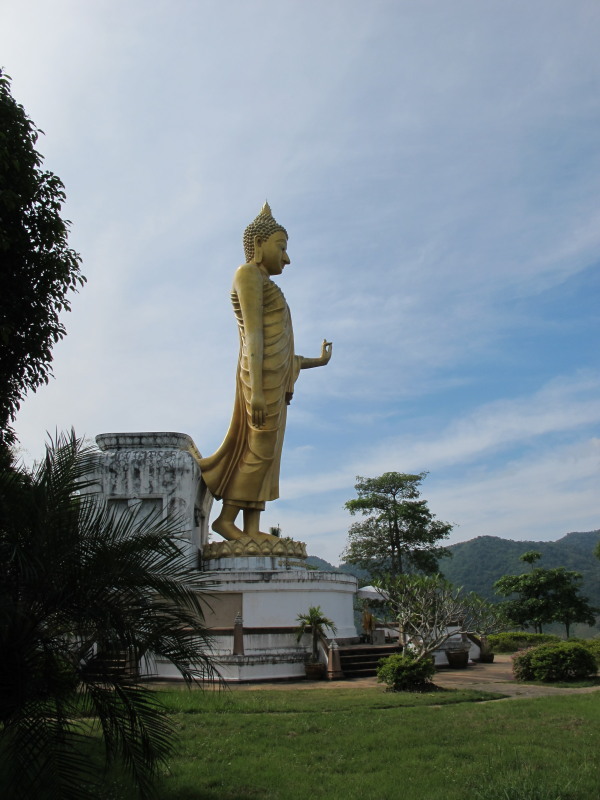 It turned out to be further on at the location of the Big Buddha. Though, I guess you’d expect a significant geographical feature in Thailand to be acknowledged with a religious symbol. The turn-off sign read one ‘k, but it was more like three. The motorbike laboured up the hill. Would be an impressive sight approaching from water level. A gesture of peace from one country to another. 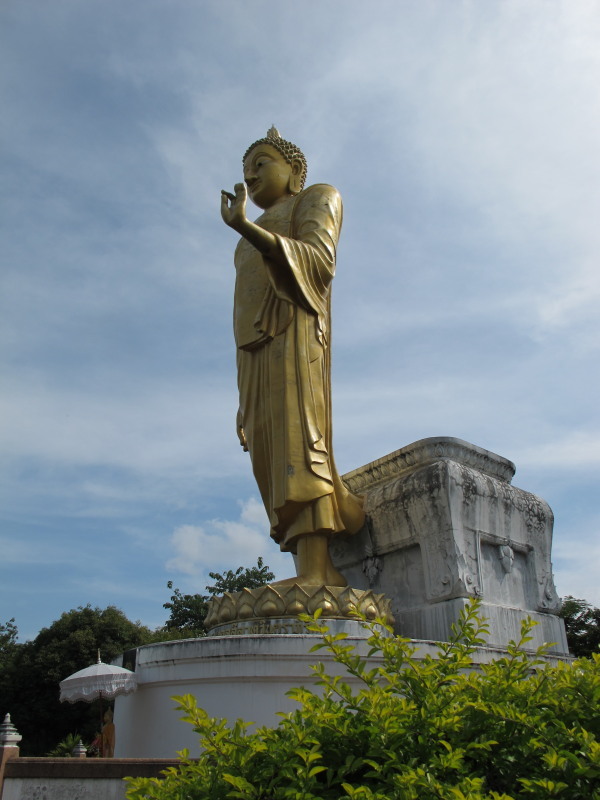 Unless there’s an element of ‘our Buddha is bigger than yours’. Either way, better than a posturing military symbol. There was no one else around except for three female vendors lacking customers, so I bought something out of sympathy more than anything else. Then as I descended a throng of sight-seers made their way up. Murphy’s. 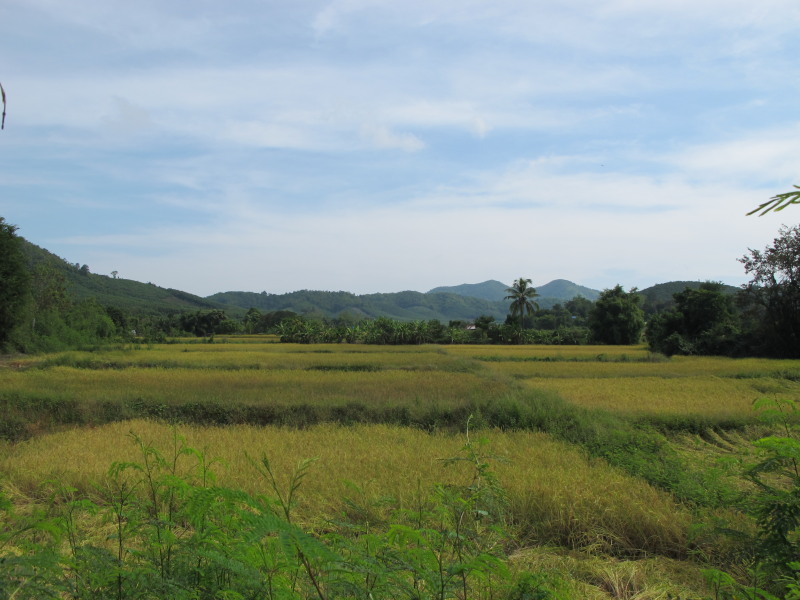 I wouldn’t say the Big Buddha was especially notable, but was made more worthwhile for the ride, enjoying the scenery along quiet roads, passing villagers tending their fields etc. 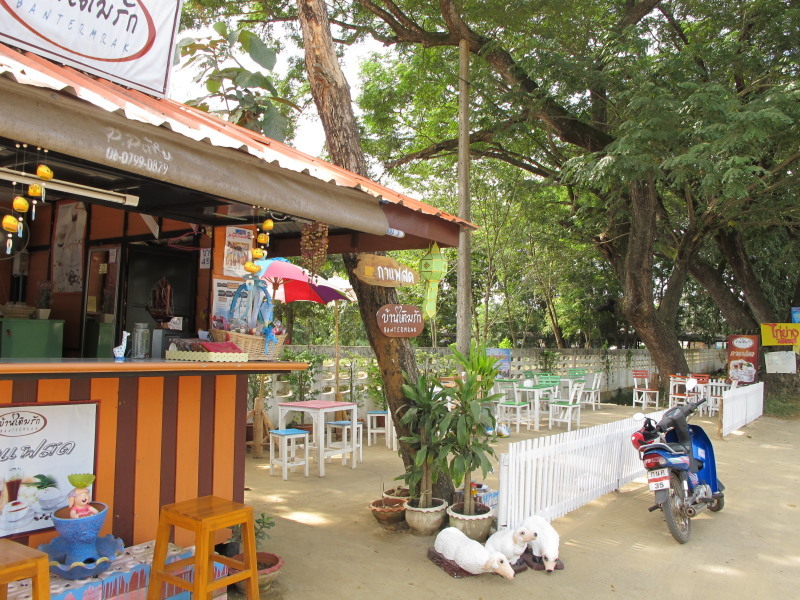 Back at Chiang Khan I went by Gung’s cafe, but nothing stirred except for a barking dog. So, I had a coffee at a place I passed on the ride into town yesterday. The girl working there gave me a local delicacy to try – a tasty coconut sweet that wasn’t too sugary. 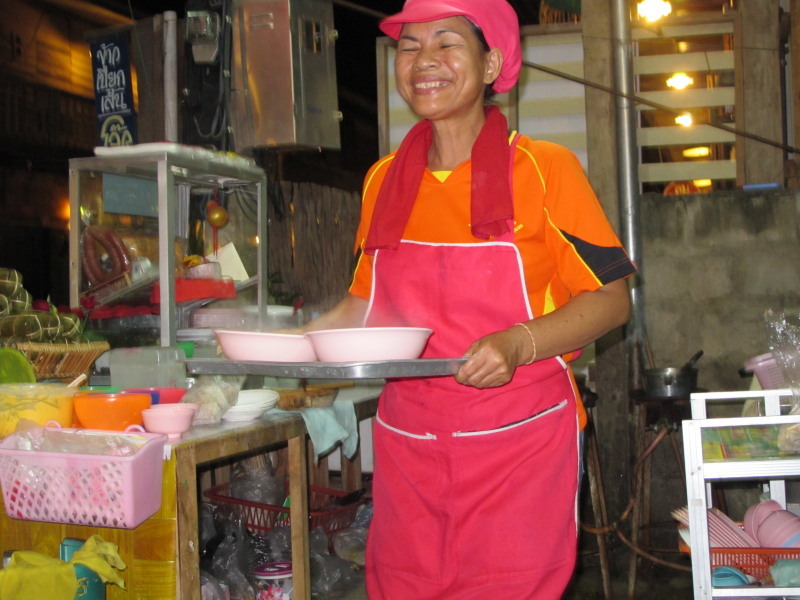 Not too-sweet desserts are typical of Thailand, as are the gestures that have locals freely offer them. 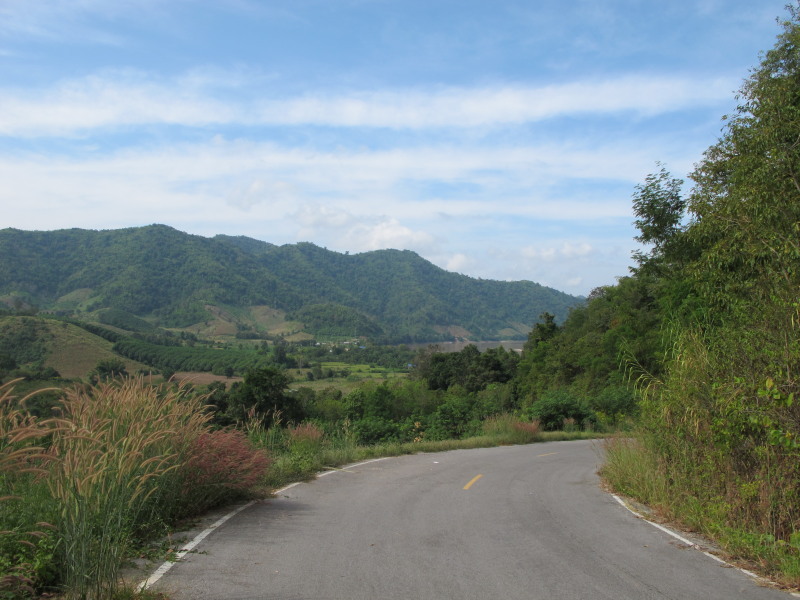 I was debating about which way to return to Nong Khai. 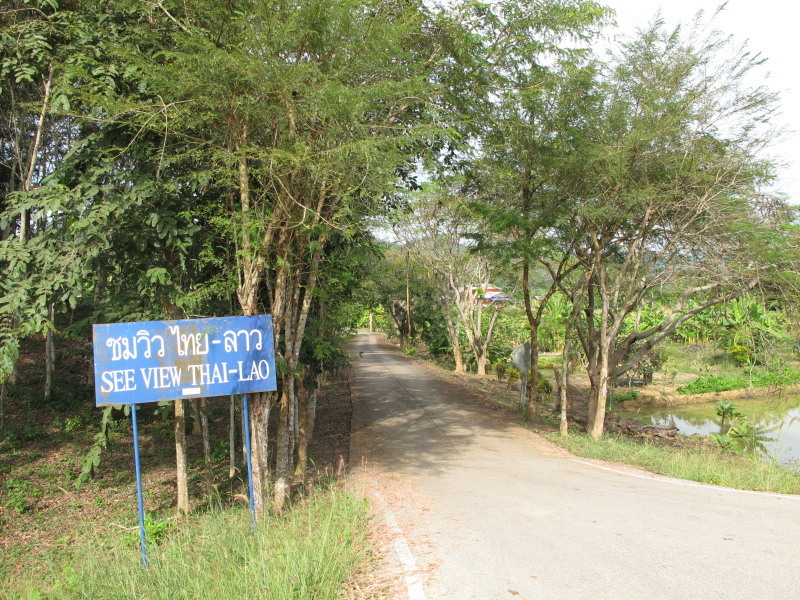 I asked here about inland loop – she didn’t know and sought the advice of a Thai customer who suggested directions, but he was uncertain about the state of the roads. 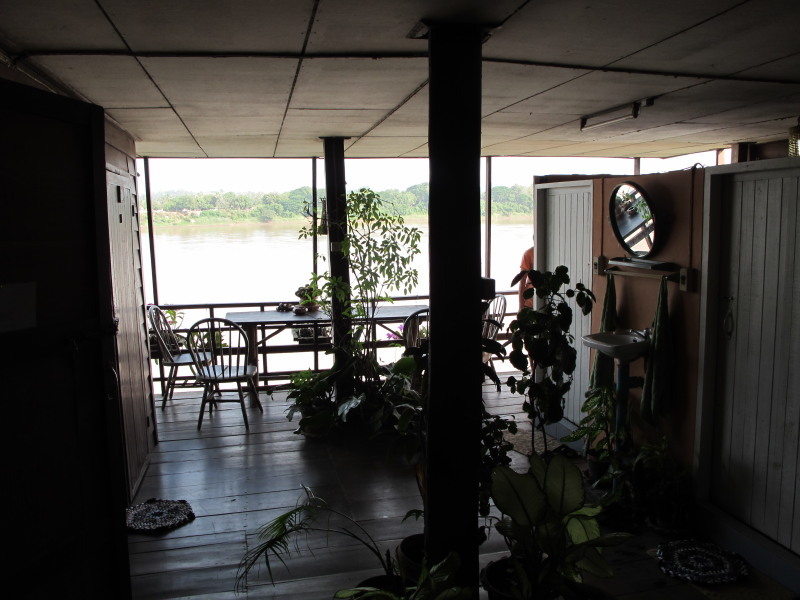 Went by Gung’s again, but it was still deserted, and it was getting close to the Chiang Khan Guesthouse 1pm check-out, so I decided to stay there another night. Had considered moving to Gung’s. 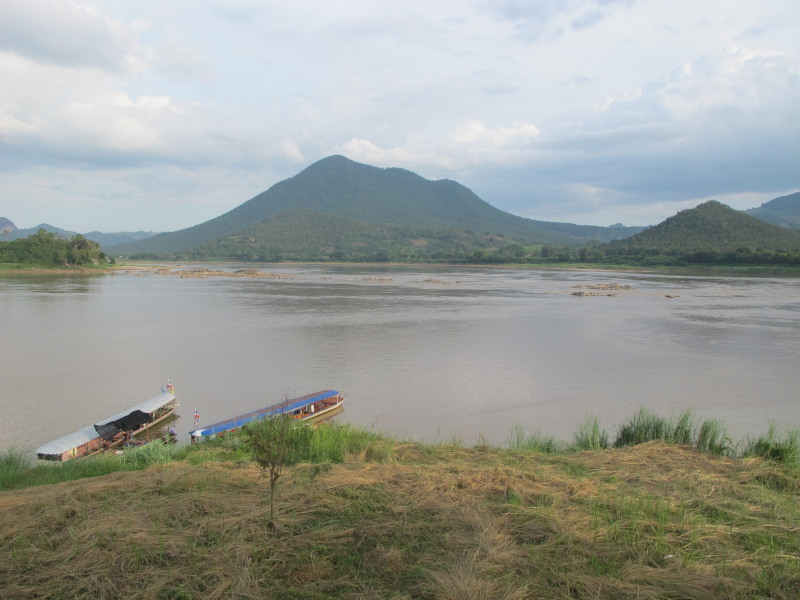 In the afternoon, I rode out to Kaeng Kuut Khu, a rocky feature in the Mekong, on the southern outskirts of town. The turn-off sign said one ‘k, but it was closer to three. The rapids weren’t particularly impressive from this distance, but the view of the hills beyond was pleasant. There were picnic areas and food stalls. I bought a crispy, prawn pancake cracker type snack unique to Chiang Khan that I can’t remember the name of. They’re everywhere at this river spot so you can’t miss them. I had one the size of a small pizza, and far too much. I couldn’t give it away, but not for want of trying. But, the extra ‘k might’ve turned out to be three, so I returned to town. 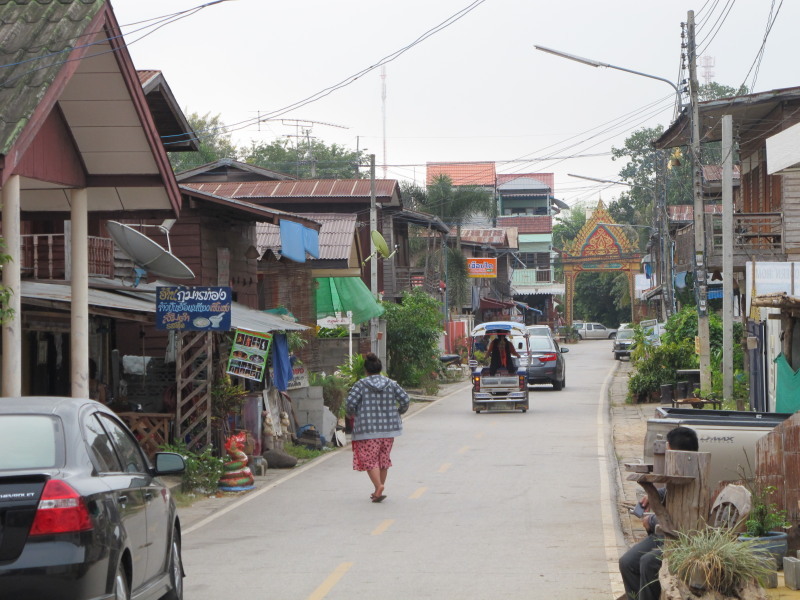 Saw Gung, had coffee – she’d been at a market this morning. Back at Pim’s, a French guest was attending his Russian Minsk 125cc that he bought in Laos for US$400. It carried him and his girlfriend and their luggage without problem (and they weren’t small people). He said it was an easy bike to maintain, and he knew nothing about mechanics beforehand. Didn’t feel inspired to follow suit – the scoot has seen better days, but prefer its temporary arrangement. Plans I had to eat at a market that night were thwarted because it was closed, so I went to a makeshift restaurant in Chai Kong Rd – a woman and man cooked meals using a portable stove, and in the adjoining shop was serve-yourself beer in the fridge – B45 for a big bottle – great value. For one confusing reason or another, I ended up with soup again. A woman drinking whisky with her friends at a table in the shop, would come over to where I was sitting, offer a toast “Chok dee!” (good luck), and ‘clink’ my glass. A skinny Farang with a toothy grin arrived and happily became their entertainment, and allowed me to skedaddle in a sober state. 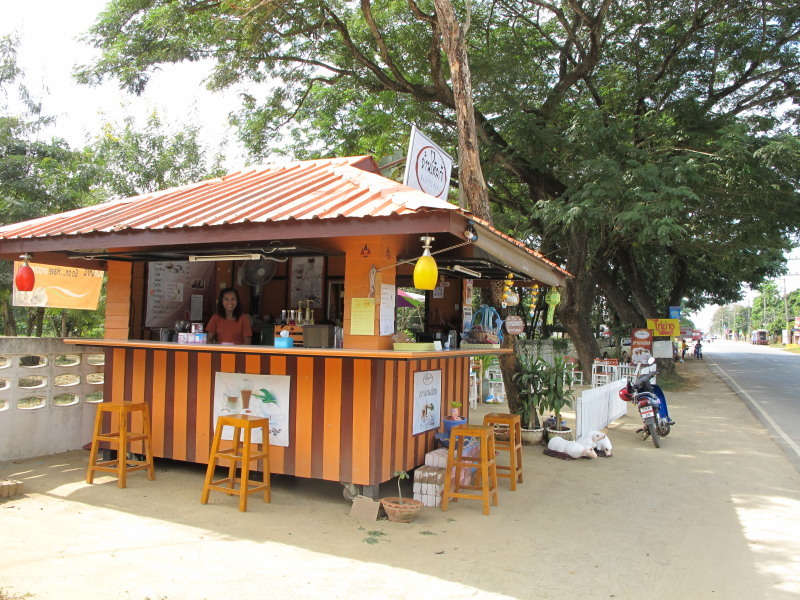 I had a final coffee from the stall run by the wai gesturing woman. She proved to be a constant among the variables. 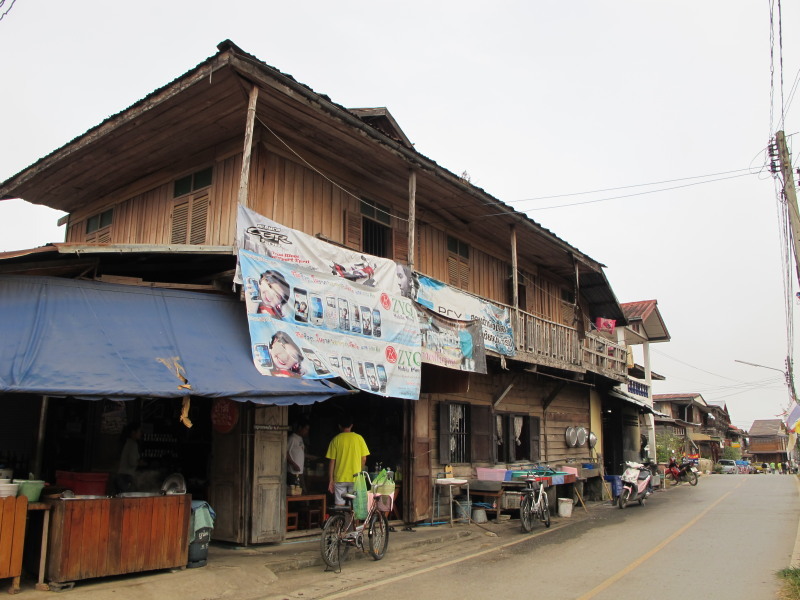 NOTE: According to Lonely Planet, Chiang Khan lacked a bank, but there’s a Kruang Thai bank (Thurs – Mon 10am – 4pm). It’s been open a year. By now there might even be more.